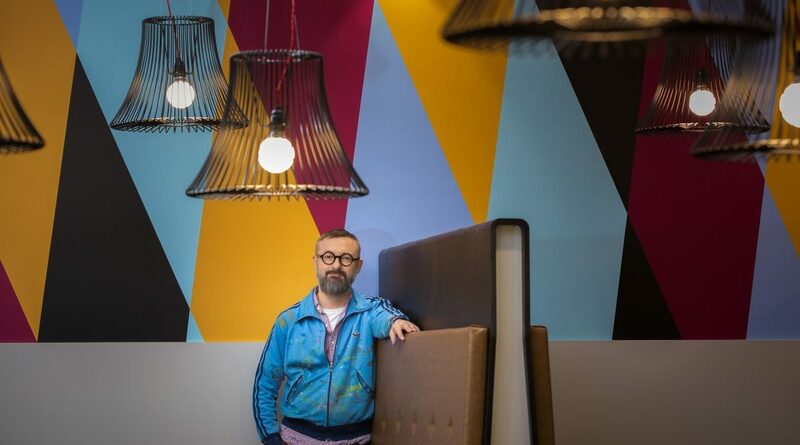 Internationally acclaimed Hope Street Xchange artist and University of Sunderland lecturer, Lothar Goetz, has unveiled his exciting new work in Hope Street Xchange. Having worked closely with the design team from the early stages of the project, Lothar has created two large murals which respond to the architectural features and transform the public spaces within the building. Entering the building on Level 3, guests to Hope Street Xchange are greeted by a wall of bright colour and geometric shapes reaching above their heads and ascending the atrium staircase. There is a second piece on Level 1 which spans the width of the cafe space and creates a sense of energy and movement. You can find out more about Lothar and see more of his fantastic pieces here.